The Mountain Buggy Duet is a cool side-by-side stroller that is relatively narrow and fits through most doorways. This stroller is easy to push and turn and earned above-average scores for maneuverability and quality. It has an adjustable handlebar and accepts two infant car seats or two infant carrycots. The Duet has air-filled rubber tires, an easy fold, thick fabric, and removable seats that are nicely padded. While this stroller is relatively lightweight compared to the competition and it has some nice features we enjoyed, it isn't enough to make it a good choice for most parents. There are options with higher overall scores that can fill almost any niche. 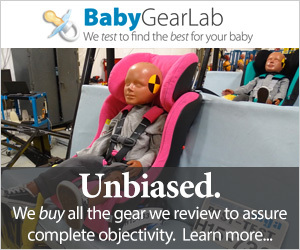 However, it is the highest scoring side-by-side that will accept infant car seats from various brands outside its own, giving it a leg up on other side-by-side options. Mountain Buggy has released a new version of the Duet stroller. Read on to see what has been changed in the new Mountain Buggy Duet v3. We are now linking to the new version, but think that the two are similar enough that this review can still give you a good idea about the new version. Mountain Buggy has kept many of the defining features of the Duet stroller the same, such as the super narrow width and the great versatility, but some components have been updated to offer better ease of use experience. The new Mountain Buggy Duet v3 now sells at a list of $730 ($80 more than the v2.5) but it is 2.2 lbs lighter with a more compact fold. The seat back is longer and it has an extendable footrest, making it better for taller kids than the previous version. The Duet v3 features a handbrake similar to those on jogging strollers, and the new version comes in a variety of new colors and patterns to boot. Above you can see the Duet v2.5 on the left and the Duet v3 on the right. The Mountain Buggy Duet earned a 5th place rank in our review and testing of 18 different double strollers. Mountain Buggy began in 1992, when a new dad hoped to create an all-terrain stroller to enjoy the New Zealand mountainside with his baby. He created the foundation of the company's all-terrain platform. While the platform has changed over time, it is still similar in style and function. Mountain Buggy now makes strolling gear for the city life as well as mountain trails. The bar graph below shows the Mountain Buggy Duet's overall performance (blue) relative to competitors. The Duet earned a 6 of 10 for ease of use, tying with the Baby Jogger City Mini Double. The photos above show the location of the folding handle under the seat and how to rotate it. The Duet fold is an easy one-handed operation that is as quick as they claim. It requires halfway bending and only has three steps with auto-lock and self-stand features. We like that the fold is smooth, but it takes some getting used to as it feels like the whole thing might bash into your shins. The auto-lock will not engage if you fold it too slowly, so it's better to give it a good yank. We think most parents will like the fold. The unfold rates easy, but it requires two hands. It has two steps to unfold, and you will need to bend halfway down. The single action brakes on the Duet are easy to set and release. The Duet offers average to use single action brakes. While the storage bin on the Duet is rather small, it can hold a lot thanks to the open design. The storage bin holds up to 11 lbs. The bin is medium in size, but we still fit our extra-large diaper bag inside because the top of the bin is open. There is easy access on the sides and back but it has a strap that runs down the center of the bin that can cause access problems. The strap is removable to open up space. The Buggy comes with a cool water bottle holder that is long and can hold taller bottles without a falling risk. The peek-a-boo windows on the Duet are a nice size, but the toggle closures are hard to operate while pushing or with one hand. Each seat has its own canopy. They are decent in size with a flip out visor, but they aren't as large as the competition, and they don't cover as much. The only ventilation on the canopy/seat is the mesh peek-a-boo window with a toggle closure. The closure isn't ideal; while arguably silent compared to Velcro, it doesn't keep the window cover closed as it is influenced by the weather. The photos above show the Duet with the seat upright and shade closed (left) and the seat reclined with the cover open (left). The buckle on the Duet is a little tricky and requires both hands to operate. The Buggy has a 5-point harness in each seat. The harness itself is difficult to get off and only slightly easier to put on. The buckle is average, and it takes two hands pressing on three different points at the same time to open it, before manually removing straps from the buckle. Adjusting the harness size is easy, as there is one adjustment for upper and lower harness straps, but the shoulder height adjustment is a rethread operation (which is harder). It has three different height options and a non-adjustable crotch strap. Adjusting the recline angle on the Duet requires 2 hands. The leg rests don't adjust and it has a narrower foot base. The seat backs recline is difficult to operate and requires two hands. The Mountain Buggy will work with two infant car seats with the purchase of the appropriate adapters. The Duet is compatible with some car seats from the following brands: Mountain Buggy, Phil and Teds, Maxi-Cosi, Cybex Aton, and Graco Classic Connect and Click Connect. The Duet setup is hard with a poorly designed manual. The instructions are multi-language with illustrations in the back of the book and it took us over 10 minutes to assemble, which is worse than over half the competition. The 10 inch rubber tires on the Duet contribute to its overall easy maneuverability. The Duet is easy to push no matter what the terrain with a score of 7 of 10 for maneuverability. This is a tie with the Phil and Teds Dot and the Britax B-Ready Double. The high score of 9 for the group was earned by the Thule Urban Glide, Thule Chariot, and the BOB Duallie. The front wheels on the Duet can be locked in place for easier moving over rough terrain. The rubber air filled tires on this stroller help it when it comes to pushing and turning over flat surfaces or bumpy roads. The two front wheel design with swivel wheels seems to help it maneuver in smaller spaces. It feels small and fit through all the doorways in our tests and around tight corners. This stroller rolls fairly well in the grass with maybe even a little one-handed pushing possible. Gravel was a little harder, but still doable, and it went over small curbs with ease. The Duet can self-stand or be laid on the ground when folded. The handlebar needs to be rotated completely down in order to stand the stroller. The Duet weighs more than the average stroller in the group with a weight of 32.8 lbs. Which means it could stand to lose a few lbs, but it is only 17,199 cubic inches when folded. This size is smaller than the average for the group of 18,921. This stroller should fit well into most standard sized trunks. The Duet scored well in our tests for quality. The Duet scored a 7 of 10 in our tests for quality; this is a tie with several other strollers we tested. The Duet is a nice looking stroller with well crafted components. The fabric is a thicker 600d canvas with a tight weave. In our tests, the hem snagged and is not as nice as the rest of the stroller. The seats have a removable cushion with a good amount of padding, and the fabric zips off for easy cleaning. It has a nice clean frame with solid connections. The overall fit and finish are good with a look that manages to be sleek and sturdy at the same time. The handlebar on the Duet adjusts on a pivot point. It has one of the largest ranges in the group. The wheels are spoked plastic with air-filled rubber tires. The tires fit the wheels well, and we didn't have any troubles. The handlebar is adjustable with one of the greatest ranges in the group. The bar is covered in foam with a coating of plastic or rubber-like material. It has more give than rubber alone but will be easier to keep clean than foam. Unfortunately, they aren't as nice to hold as a foam covered bar. The handlebar is wide with a little slope at each side, making it more ergonomic for the pusher. The Duet doesn't have shocks which seems short-sighted for a stroller designed for uneven terrain. The Duet is a potential option for twins because it works with two infant car seats. It also accepts two carrycots for smaller infants, and it has configurations where both seats can face the pusher which is nicer for babies who want to watch mom or dad. Also, as children age they will experience the same seating arrangements, theoretically cutting down on the arguments siblings can have over seats with different features.